Dixon Air King couplings are recommended for use on virtually any type of pneumatic equipment. The maximum recommended working pressure for Dixon Air King is 150 psi at ambient temperature 70 degrees F. With the universal head, any fittings within that range can be connected regardless of hose shank or thread size. Meets pressure requirements as specified in A-A-59553 commercial item description superseding Mil Spec.WWC-633D. Rubber seal. Made of iron. 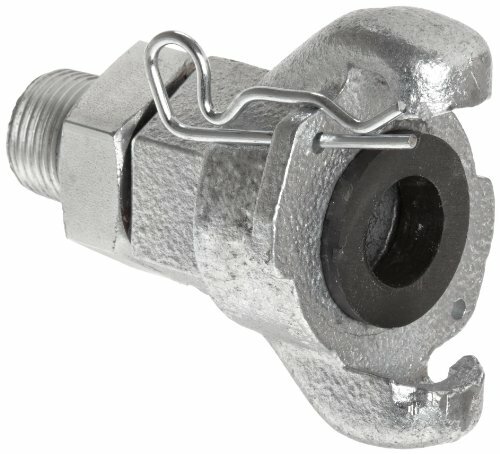 These universal swivel fittings interchange with other Air King fittings and include a heavy-duty, free-turning joint that swivels under pressure to prevent hose kinking. For air and water service only. 1/2" NPT male.